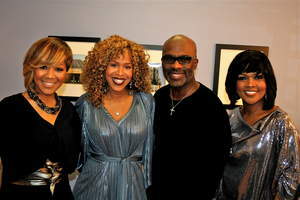 NEW YORK, NY--(Marketwire - January 25, 2011) - R&B and Gospel icons Bebe & Cece Winans and Mary Mary have jointly announced a series of upcoming major market US tour dates this April, 2011. The duos re-unite following their spectacular holiday performance on The Tonight Show with Jay Leno, where Bebe, Cece, Erica and Tina dazzled the studio and TV audiences with a festive holiday medley, showcasing a collective talent unmatched throughout the world. That superstar 'quartet' will also be performing songs together on this tour in addition to their respective hits and fan favorites. After two decades of hits, Bebe & Cece Winans are enjoying a remarkable career moment. Their first album together in 15 years -- Still -- is nominated for two Grammy Awards and is fast approaching Gold, while landing on several Billboard Magazine year-end lists. This weekend, Bebe & Cece won a combined five Stellar Awards out of 11 nominations, including Song of the Year for the CD's single, "Close To You," a Billboard chart topping single. Additionally, "Close To You" was named BMI's Most Performed Gospel Song of the Year. Written by Bebe Winans and published by Music of Everhits, the song also earned the 2010 Dove Award for Urban Recorded Song of the Year. Bebe & Cece Winans celebrated the honor with a blazing performance of "Close to You." In the past year alone, Bebe & Cece have performed on Oprah, Good Morning America and The Tonight Show with Jay Leno. Upcoming this October, 2011, the brother/sister duo will receive their star on the Hollywood Walk of Fame. Columbia Records/Myblock Records artists Mary Mary, the gorgeous duo -- sisters Erica and Tina -- will release their new CD, Something Big, the long-awaited follow-up to The Sound, their multi-million selling, multi-award winning, groundbreaking previous CD. Something Big is slated for a March 29th, 2011 release. Produced by Warryn Campbell for Myblock Records and written by Mary Mary, anticipation for Something Big is shared by fans, label insiders and industry alike. In less than a decade, Erica and Tina have sold upward of five million albums and have amassed staggering totals of three Grammy Awards, two American Music Awards, seven Dove Awards, a BET Award, two NAACP Image Awards, two Lady of Soul Awards, and ten Stellar Awards.